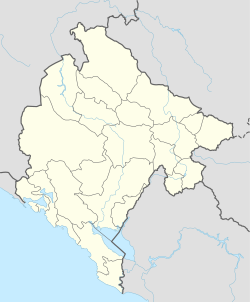 Tuzi (Montenegrin Cyrillic: Тузи, pronounced [tǔːzi]; Albanian: Tuz) is a small town and seat of Tuzi Municipality, Montenegro. It is located along a main road between the city of Podgorica and the Albanian border crossing, just a few kilometers north of Lake Skadar. The Church of St. Anthony is in the centre of the town. Tuzi is the administrative centre of the only predominantly Catholic municipality in Montenegro. Tuzi is situated to the northwest of Lake Skadar, 10 km from Podgorica, 150 km from Dubrovnik (Croatia) and 130 km to Tirana (Albania). It is located in surrounded by forests and mountains that are further connected with Prokletije. As in all cities in Montenegro, Tuzi has a health centre, elementary school "Mahmut Lekić" and the high school "25 Maj". Later developments also include a football stadium. Korita, Lake of Rikavac, Vitoja, Cijevna river etc. The town of Tuzi is situated between Podgorica and the Skadar lake. The Albanian community of Tuzi descend from the surrounding tribes of Hoti, Gruda, Trieshi and Koja, part of the Malësor tribes. In 1911, for the first time since the era of Gjergj Kastrioti, the Albanian flag was risen on top of the Deçiq Mountain in Tuzi during the Battle of Deçiq. In the battle, Ded Gjo Luli led the Albanians to victory against the Ottomans which marked the turning point in Albanian self-determination. According to 2011 census, the town of Tuzi has a population of 4,748, while Tuzi Municipality has 12,096 residents. Out of this, roughly half are Albanians, but there is also a significant percentage of Bosniaks, Muslims by nationality, and Montenegrins. Wikimedia Commons has media related to Tuzi. ^ "2011 Census Preliminary Results" (PDF).